On a chilly winter day after the introduction of the Quilts of Valor fabric collections at Fall Market 2010, several Moda staff members sat down to discuss ways to honor the men and women who sacrifice and fight to defend our country’s freedom. Thus was born the Just One Star Project. Could everyone make just one star? Yes! Could we piece a hundred quilts in 100 days? Yes! Could we quilt a hundred quilts in 100 days? Yes, thanks to the generosity of long-arm quilters across the country. Through the efforts of quilters across this great nation and around the world, this mission was a success and then some. 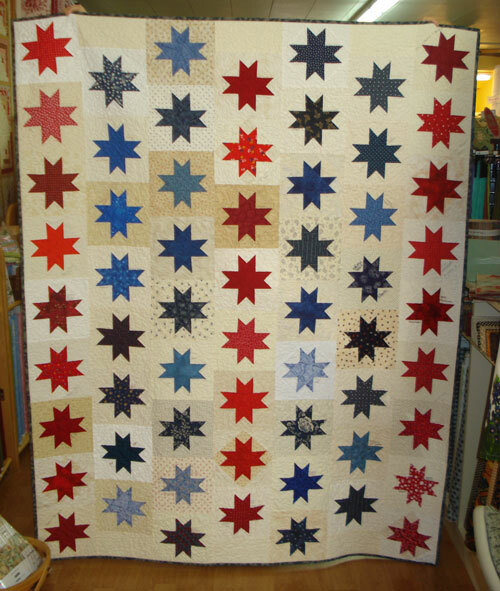 We were grateful and overwhelmed by the response to our call for "just one star block". 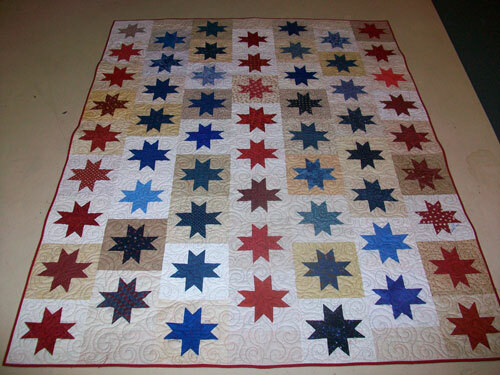 Quilters like to piece in multiples...if they are piecing one block, why not piece 10. 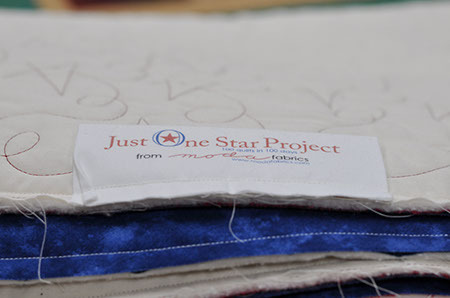 To this end, we here at Moda received over 15,000 individual star blocks for the Just One Star Project. Thank you to all who participated. 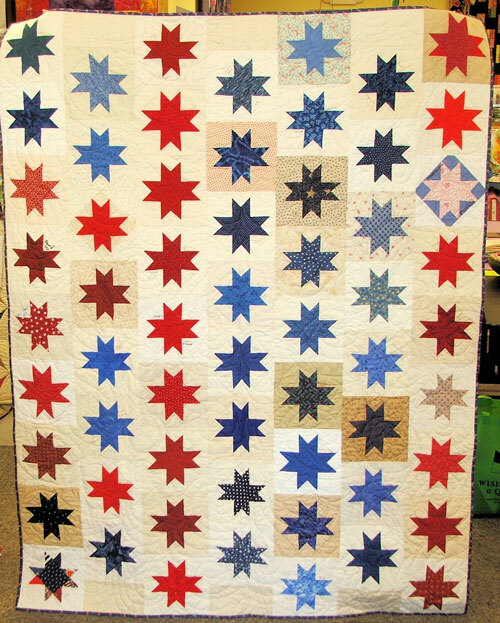 For this reason and so our heroes are never forgotten, we introduced phase two of our star project – a shop challenge – Made With Love – 100 boxes, 100 quilts, 100 days – Valentines’ Day, 2012. Valentines’ Day, 2012 arrived on Tuesday and we are pleased to share with you the shops who sent us photos of their quilts and a bit of info about their shops. We here at Moda and the Quilts of Valor Foundation thank each and everyone who has participated in this challenge including those who completed their quilts, donated them to QOVF, but couldn’t find their camera for a photo or two. ﻿﻿﻿﻿﻿ Their Story:"Happiness is Quilting is located in the heart of historic downtown McKinney, Texas in a building that is over 100 years old. Our 13 employees are quick to help and eager to serve. We love our customers and the art of quilting. This year we are planning workshops with Harriet Hargrave, Sue Daley and Janice Vaine. 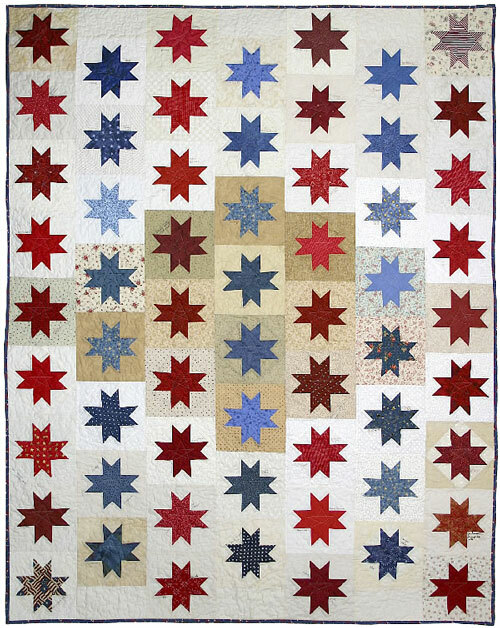 We will also be joining the Texas State Shop Hop and vending at both the Plano and Dallas Quilt Show. Our shop carries a little bit of everything happy!" Their Story:"Quilters Corner focuses on presenting a wide variety of the best the quilt world has to offer. We hope that our guests can always find something inspiring no matter what their preferred style. There is always something special planned in the shop. 2012 will begin with a Fat Quarter Fling (a party where we actually will fling some fabric! 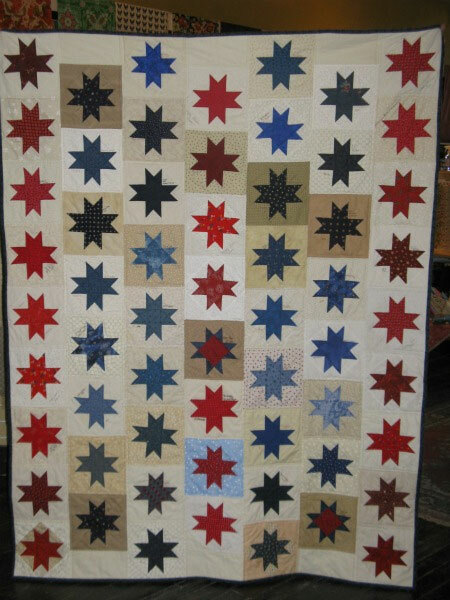 ), next will be our Super Game Day event, the 2012 Quilting and Needlework Seminar at Trax, the Western PA Shop Hop and on and on! 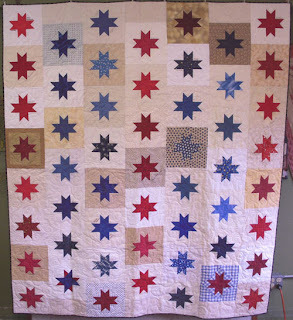 At Quilters Corner we find true joy in sharing beautiful quilting goodies with those who visit. Approximately 8000 bolts of striking cotton are complimented by the beautiful displays and samples that tempt from every corner. Enthusiastic staff members are always willing to offer encouragement, instruction and their love of fabric. We extend an invitation to visit when you next find yourself in western Pennsylvania!" Their Story:"Boersma’s is a family owned business since 1935 and has been located in the Historic Downtown District of McMinnville, Oregon for the past 50 years. 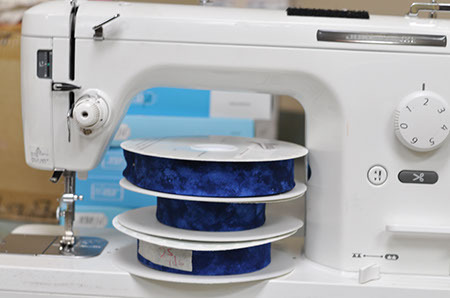 Boersma’s offers 12,000 square feet of full service retail space including 12,000+ bolts of quality cotton fabric, sewing machines, sergers, longarm quilting machines, and repair service. Classes are offered for quilters at all levels. We added a 2000 square foot yarn shop across the street in 2005 with everything for your knitting and crochet needs." ﻿﻿﻿﻿﻿﻿Their Story:"Our shop is housed in a one hundred old building in a quaint town, population of about 4,000 people. Our store sells mostly Moda fabrics, but we do have other brands as well. We love the traditional look, but we also play with batiks and brights. Our store motto is "Where Color and Design are Ever Changing." We sell a lot of kits from very easy to challenging. We have something for everyone." Their Story:Quilters Eden completed 2 quilts! 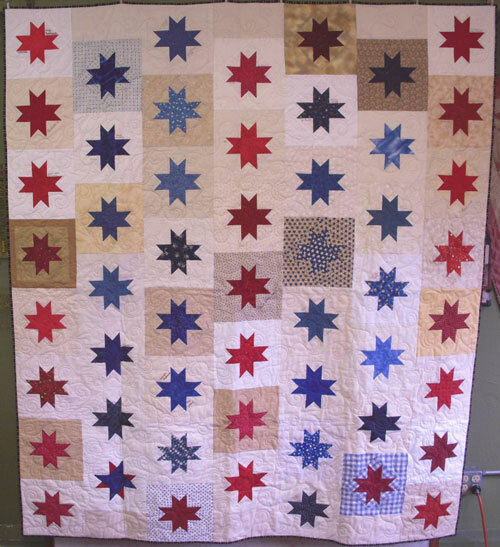 One quilt – Quilt #69 – was made in honor of Lt. Col. Ira V. Fordyce. Their local guild is holding it’s annual QOV workshop on March 3, 2012. The 2 quilts will be handed over to the local QOV representative at the workshop! 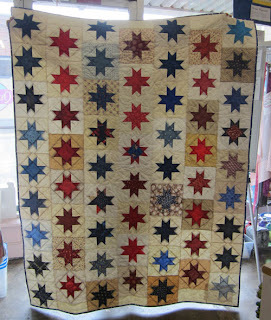 Material Girls Quilting1124 Birch Bay Lynden Rd. "Quilting the world together, one stitch at a time"! Their Story:"We are located in a charming two-story farmhouse in Vista, California. When you walk through the door, you know you are home! Friendly helpful staff, ready and willing to help you with any of your quilting questions. 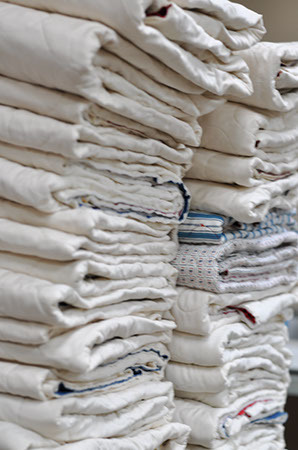 Need help picking out fabric … we are there for you! Most times of the day, you’ll find our classroom full of students! 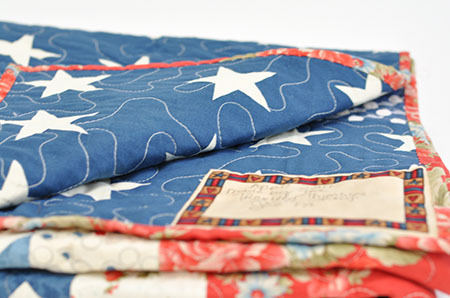 We carry a wide variety of civil war and 30’s reproductions fabrics, brushed cottons, homespun’s, wools and (just a few) bright modern fabrics that young mothers love. We have seven block-of-the-month classes, several trunk shows, plus 3 shop hops planned for this year. We also participate in the Pillowcase Challenge, Covers with Love and The Linus Project. Stop by and be inspired – meet your friends at Fat Quarters Quilt Shop!" Their Story:"Pink Chalk Fabrics is an online shop that specializes in contemporary fabrics for the modern sewist and offers more than 1,000 pattern titles from independent designers. We love our customers, sewing and providing outstanding customer service! Our quilt will be going to a a local group called American Hero Quilts that distributes quilts to servicemen and women that pass through Madigan Army Hospital in Tacoma, Washington." See Pink Chalks' blog post about their Made with Love quilt. 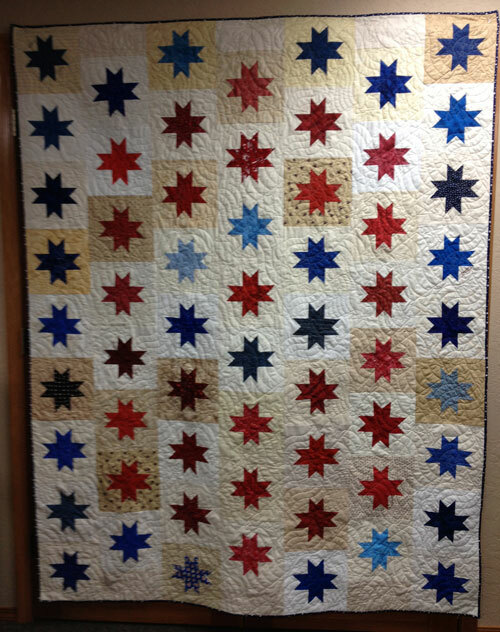 Their Story:"Our quilt was created with the help of the Quiltique staff, as well as the Las Vegas Modern Quilt Guild that meets here at the shop." Their Story:"ThreadBear is located right on the Old Town plaza in historic Las Vegas, New Mexico, where the Sangre de Cristo mountains meet the Great Plains. ThreadBear specializes in fabrics with a bright, contemporary look, but has something to please every quilting enthusiast." Their Story:"Wish Upon a Quilt shares our love of sewing by bringing by bringing the best selection of fabrics, books, and notions to our customers. We carry brights, batiks, Kaffe Fassett and lots of Moda. Join us for Quilters Retreats, Christmas in July, our Anniversary Party and the Quilt Carolina Shop Tour. Our goal is to make everyone just a little bit happier each day." 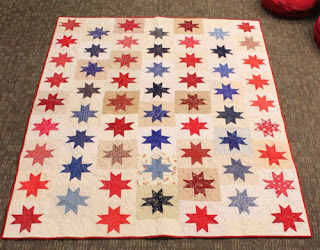 The stars in the quilts above are very much like the citizens of this great nation, each is unique, but together represent a colorful and united patchwork that is our country strong and true. 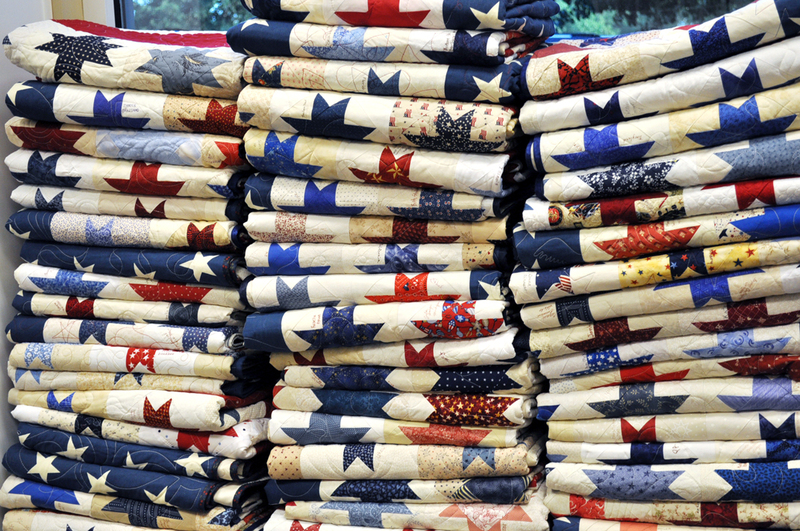 The need for quilts for the Quilts of Valor Foundation is ongoing. Thank you for your continued support of this worthy project. 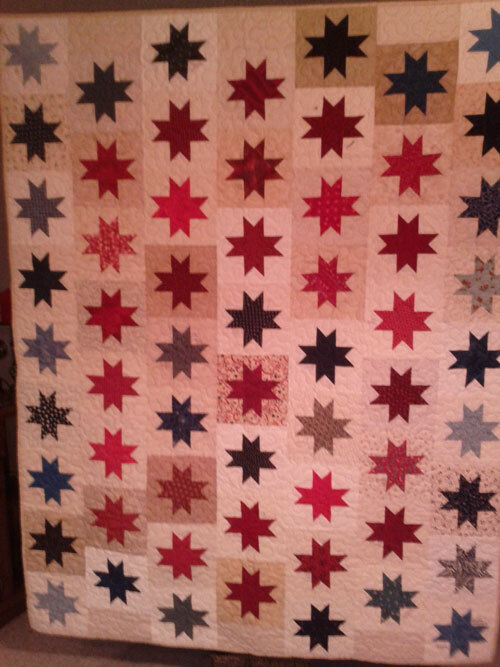 Thimble N Thread quilt shop from Richland Center, Wisconsin sent in this quilt. A wonderful machine embroidered label on the back of the quilt along with a note requesting the quilt to go to a soldier from Wisconsin. They also included a newspaper clipping from the Richland Observer dated May 12, 2011. 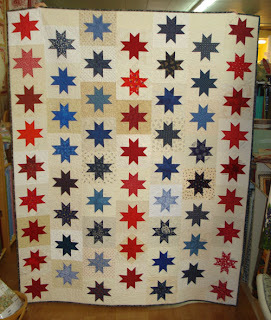 Thimble N Threads customers made over 130 blocks for the Just One Star project. Their blocks made over 7 quilts for the soldiers. A Quilt from Erie, PA.
Troubled Thimbles (don't you love that name for a friendship group?) 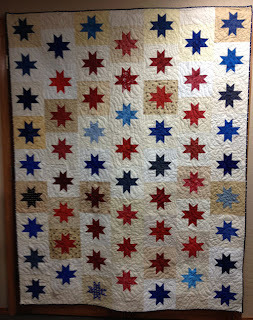 and Circle of Friends quilt group in Erie, PA made this quilt and sent it in. 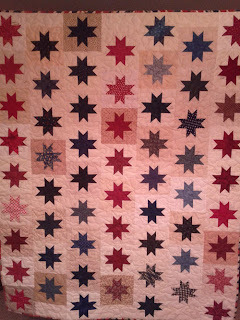 Thank you to Nancy Zimmerman from Z Quilt Shop for organizing this quilt. Blocks have been coming in by the bunches. Last count over 15,000. Thank you to each and everyone of you. Here are a few pictures of the process. Each package has been opened and sorted. The maker is being logged into a database. Each of the blocks is pressed and trimmed. Thank goodness for the Martelli Roundabout. It was easy to trim 2 sides, rotate the mat and trim the other two sides. There are 3 pieces to this-cutting mat, rotating gripper and ironing mat. Quilt squares and fabric were sent to staff here at moda, volunteers, quilt shops, and quilt guilds. Then it all happened, completed quilt tops newly quilt came pouring in. They were trimmed and prepared for binding. 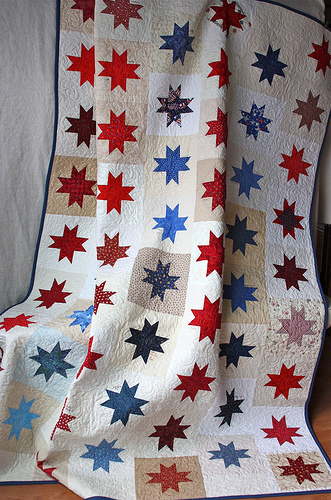 Each quilt has a just one star label sewn into the binding. Thank goodness for Moda's pre-made bias tape. Ask for moda's binding, QB2 at your favorite quilt store. It works beautifully. Can you imagine making over 27,000 inches of binding? 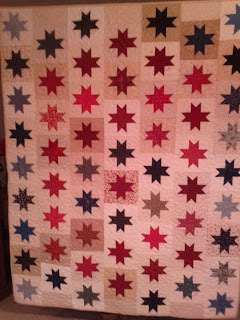 That was what was needed to complete just 100 of the quilts. And my sewing secret is the Juki sewing machine. It is a industrial home machine. It doesn't do anything fancy....just frontwards and backwards..........but really fast. 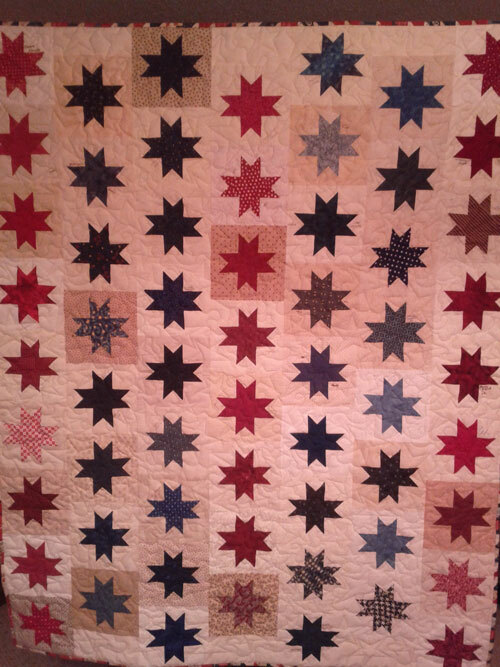 Check back with us to see some of the finished quilts and read some of the stories that were sent in. A great big hug and thank you to everyone that has had a part of the process. 100 quilts in 100 days! 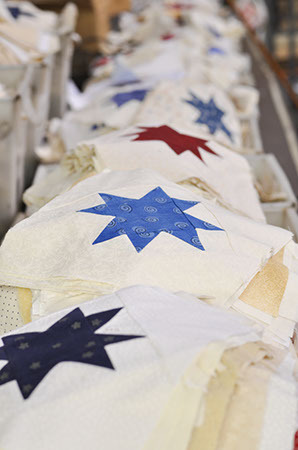 A HUGE thank you to the hundreds of quilters, sewers, binders, ironers, sorters and organizers that have all volunteered their time for Moda's Just One Star Program. As of June 14th we have met our goal of 100 quilts in 100 days. The generosity has been overwhelming. I am personally moved by the generosity of quilting community. The notes and letters have touched us with the stories. I know that the soldiers that receive these quilts will also be moved by the time, talent and love that have gone into each of these quilts. We have received blocks from all over the world for this event totally at this point 12,000 blocks. This event has grown much bigger than we could have ever imagined and we owe each of you the participated a big thank you. here, so check back for additional details. 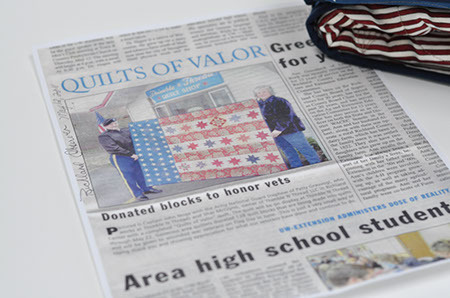 Note from QOVF website: Just how much of an impact has the Quilts of Valor Foundation made? 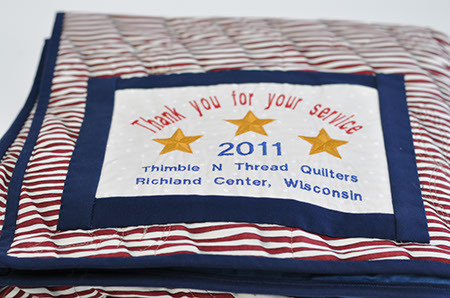 As of February, 2011 there have been over 37,000 quilts awarded to service members/veterans. So this project inspired us to take it a step further. Flag of Valor pattern by Minick and Simpson. by Flag Day, June 14, 2011. As the saying goes – “many hands make light work”. We need 1800 star blocks to reach our goal. 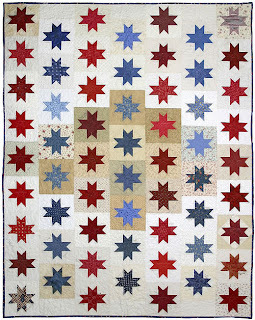 Please take a few minutes to piece Just One Star block (click here for block pattern) using a medium red or blue and a cream background. 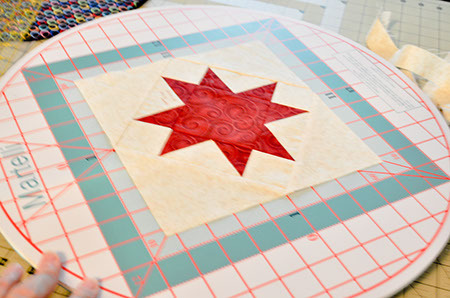 Better yet, invite your small group or even your entire guild to make Just One Star block. Sign each block with your name and state. Then we can truly say....the hands of a grateful nation comfort our soldiers! that is near and dear to designers, Polly Minick and Laurie Simpson. Mark Dunn, Laurie Simpson, Polly Minick and Colonel James J. Minick USMC will be involved with the Semper Fi organization to donate the completed 100 quilts. 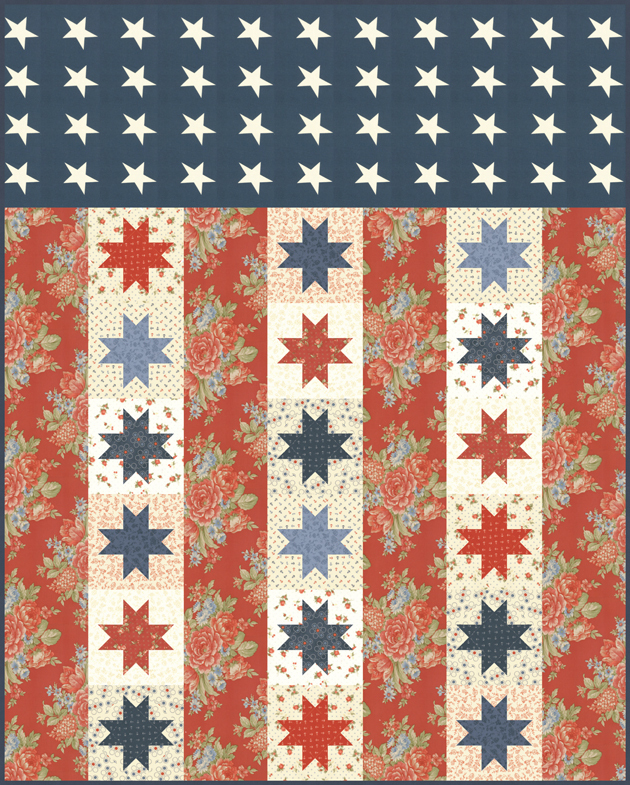 Make a quilt block (blocks) to support moda and Semper Fi's efforts. 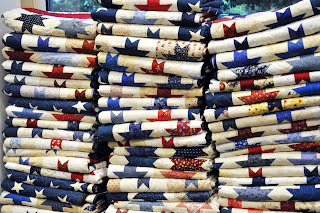 quilt store to benefit Quits of Valor .